A life-changing moment can often be waiting around the corner, and can appear in the most unexpected ways. But for this to happen, we have to be alert and aware of the people around us. We all have a story - many of which are fascinating and can inspire others. This applies, not least, to our elderly. This heartwarming story is a perfect example. 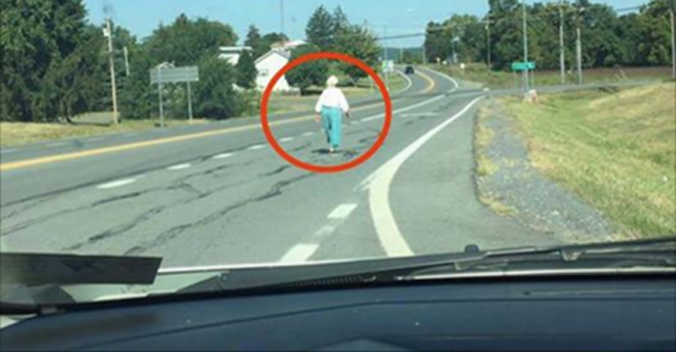 A motorist, who shared his story on Facebook page 'Love What Matters', was out driving in his hometown of Martinsburg, USA, when he saw an elderly lady walking alone on the road. He didn't recognize her and thought it odd, as pedestrians along that road were unusual. He decided to stop and check up on her. He approached her slowly, rolled down his window and asked where she was headed. The elderly lady replied that she was heading to a store in Hedgesville. "I was stunned- hedgesville is 10 mins driving from where we were talking," the driver wrote. He asked the elderly woman why she wanted to go all the way there. She then told him, with tears in her eyes, that she'd once lived there, but after her son died, she'd been moved to a nursing home in Martinsburg - where she didn't know a single person. Moved by her story, the man offered her a ride. "She looked confused so I told her to get in and I would take her where she needed to go and then make sure she got home safely," he wrote. The lone traveler got into the car - and the driver prepared to take one of his life's most memorable journeys. Her name was Isabelle. She was 93-years-old and a full blooded Indian. She spoke passionately to him about her life: her five marriages, the mountains that surrounded her when she was growing up. She told him stories of Pearl Harbor, and the Hindenburg. "She was amazing, full of life and laughter," he wrote. The car ride passed in a flash, with all the entertaining stories Isabelle had to tell. When she went in to the store, the man waited outside in the car - and was surprised when she returned very quickly. All she'd picked up was some coffee. That's when he understood: Isabelle's long walk to her former hometown was simply in hope of meeting someone she could talk to. And so he prepared to take her home. On the way back, Isabelle seemingly forgot the address. She asked the good-natured driver if he knew where she lived. He just smiled. "Let's drive and you can try to remember as we go," he told her. And so they drove on... and Isabelle continued to tell stories about her life. How she'd worked on a farm at age 12, and how she'd had her first love there. After a long period of driving and storytelling, Isabelle finally found her home. Before stepping out of the car, she turned to the man who'd stopped and picked her up. "I don't know where you came from but thank you." The driver had to fight back the tears. He gave her his number and said she could call him anytime if she needed help. Here's how he summarized his life's most exciting drive. "I probably will never hear from Isabelle, potentially will never see her again. But she gave me one of the most incredible mini adventures by allowing me to travel back into time to experience the stories of her life. I hope Isabelle is okay, that knows she is incredible and touched my life today." We must never stop speaking to our elderly. They have so much to share and so much to tell. Things we can learn from - or just small things that make us smile. And in any aging body dwells a spirit who wants to stay young. This motorist got a memory for life by listening to and helping the 93-year-old lady. I hope that all of us share this story, inspiring others and reminding them that we must never ignore our elderly - and that a good deed is never in vain.